So for anyone who lives outside of Arizona that's been wanting to read and/or purchase Fallen, Inc. Good news! I have *FINALLY* put together a website where you can do so. 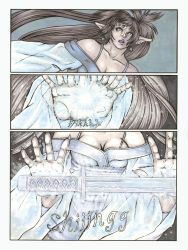 Be sure to check out falleninccomic.com/ The webcomic portion is currently making it's way through issue #1. If you want to read a head of the rest of the internet issue #1-3 are currently available in the online store! I suppose I can't really say I'm new here. I made a new account under my official pen-name figuring it might be confusing to people if I'm called H.L. 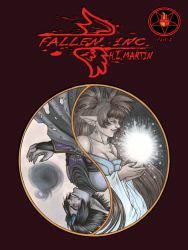 Martin on my comic and something else on my DeviantArt. That said, let's get on with the introducing myself. I am the Arizona-based independant comicbook artist responsible for the creation of the gorefest known as Fallen, Inc. A lengthy description, I know, but I am rather proud of it. 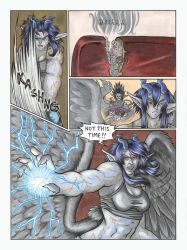 Fallen, Inc. among many things, is a comicbook about demons posing as human "paranormal exterminators". I'm sure just from that statment people are already sizing this up as a Devil May Cry clone. Trust me, it isn't. Fallen, Inc. as I said is about demons, which means the perspective is different from DMC which favors a human (or at least half-human) perspective in which the motivation is saving the world and such. 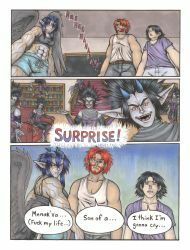 FI favors a demonic perspective in which the outcast group of demons employed by the title company veiw this as a turf war. They live in the human world and feed off the humans and they don't want other demons in "their territory." So as is the way of devils, if they get in your way, kill them. Fallen's is a full-blood Erynae(wrath demon) WOMAN. Why Can't I find Fallen, Inc. at [insert store name here]? Unfortunately, because I am an independant I pay for all printing and shipping charges out of pocket. Thus, for the time being Samurai Comics, Jesse James Comics, Dr. Fantasy's, Hero Comics, and Pop Culture Paradise are the only places in the world carrying it at the moment. Will you distribute to other places in the near future? If I can afford it, yes. Anyways, that's all I can think of at the moment. Please be sure to visit Fallen, Inc. Comic on facebook. Wallpaper of choice: F you! my room's painted! Thanks for favoriting my art! Thanks for the FAVES "
No prob your work is lovely! Just added you! Merci beaucoup for the watch! Thanks for faving my baby boy! Oh no prob he's beautiful and that was a really great shot of him!